Online renewal is available for patrons wishing to renew without changes to their current series. Please follow the instructions below to complete your renewal. Patrons who want to make changes to their series and/or seating should call the Box Office at 314-534-1700. Do you have an slso.org login? If the answer is yes, click below to renew your subscription. Have you logged in to slso.org but cannot remember your password? If you have logged in to your account the past and cannot recall your password, click below to reset your password. Once you have located your password, return to this page to renew your series. What if you have never logged in to slso.org? If you don't have a login, start by locating your account. You'll need to enter your Patron ID, phone number and ZIP code found in Step 1 of your Order Form. Please note that you will also need to provide an email address in order to place your renewal online. Once your account has been located, return to this page to renew your series. St. Louis Speaker Series subscribers can locate your "Box Office ID" in the lower left-hand corner of your Renewal Form and use that in place of the Patron ID to locate your account. 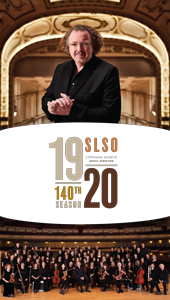 If you have any questions or wish to complete your renewal by phone, please contact the Box Office at 314-534-1700. Subscribers enjoy the best seats and savings with unlimited free exchanges.